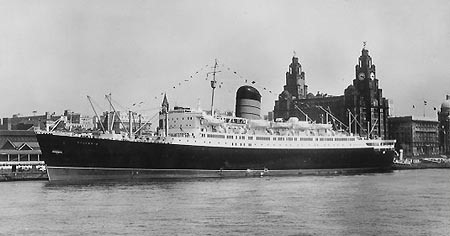 The Cunard liner SYLVANIA was the fourth and final Liverpool-based ship of the SAXONIA class. In March 1955 the Cunard Line gave John Brown of Clydebank the confirmation of an order for the final ship in what the shipping press was describing as a 'brilliant quartet'. 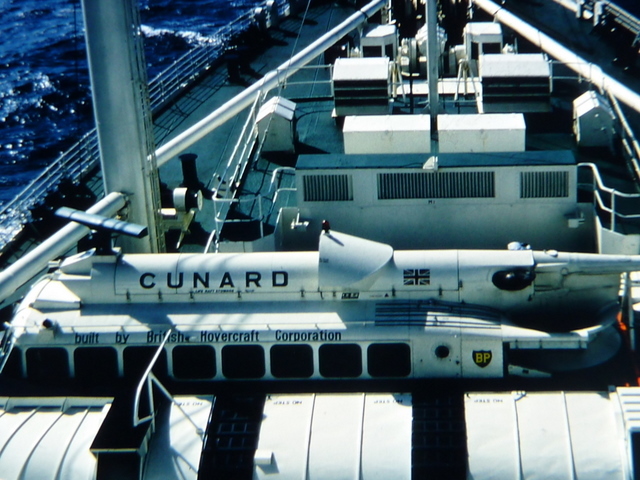 Thiswas to become the SYLVANIA and she was launched by Mrs Norman Robertson, wife of the Canadian High Commissioner in London, on 22nd November 1956. 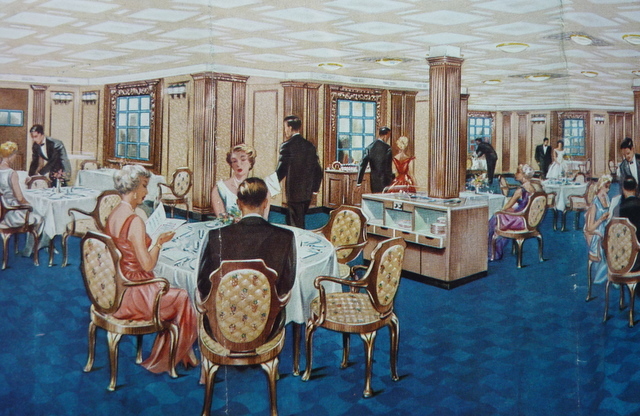 The Cunard directors remained convinced that for another decade at least there would always be sufficient passengers who would wish to travel in a certain degree of luxury and style which would keep the new liners viable. 26th May 1957, ready for her sea trials over the Arran Mile on the following day. The new SYLVANIA was ready for her trials over the Arran Mile on 27th May 1957, and two runs were made, at 5.am and 9.30am. 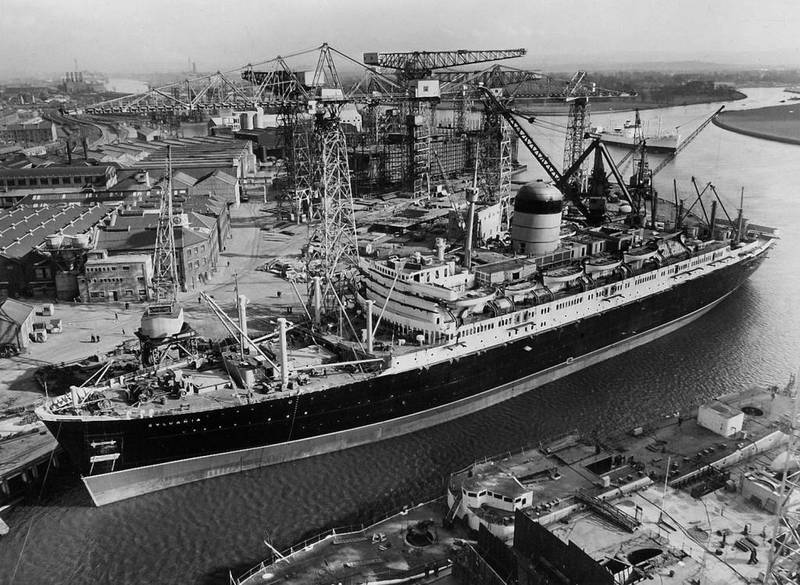 The new ship left Greenock on 5th June 1957 on her maiden voyage to Quebec and Montreal. Industrial troubles at Liverpool had prevented the new liner visiting her home port prior to the maiden voyage. "The last fifteen months have probably been the most difficult in my 45 years' service with the Company. In that time, up to March 1957, we have suffered from trials and tribulations, mostly from labour." "We may go on and build other ships in the future because we have a great and abiding affection for our Canadian cousins. Canada has developed and is going to be increasingly important to our daily life. There is an enormous potential there and we, as a Company, have tried to be of service to it. Cunard's total share of the Canadian passenger trade, since 1947, both westbound and eastbound, has totalled 614,000 passengers." The Cunard Line took the opportunity to announce that following the successful completion of its building programme for the Canadian service, a berth had been reserved at Clydebank for a further passenger liner to replace the ageing BRITANNIC. and bay windows are added attractions. Clifford's Inn Room at the South Kensington Museum. Fancy !!! mirrors, between each of which was a mural depicting fruit harvesting. scheme. Its mullioned windows look to port, starboard and forward. the work of the Canadian artist, Tom Luzny. 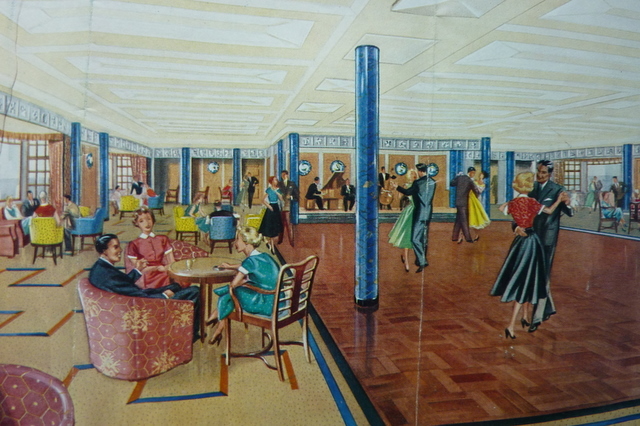 room, passengers can look to port, starboard and the after part of the ship. the variety of unusual woods from which their furniture was constructed. 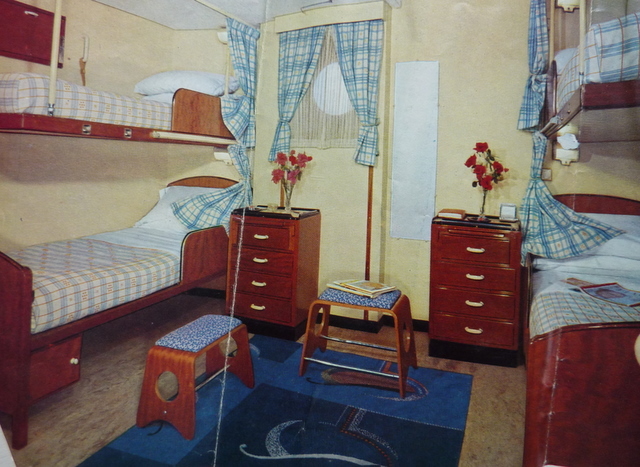 tourist-class staterooms were decorated in a pleasing range of painted schemes. There were reading lights above each bed, and bathrooms were close at hand. The SYLVANIA berthed on the north side of Pier 92, North River, New York. On the south side of the Pier, the funnels of the QUEEN MARY can be seen. 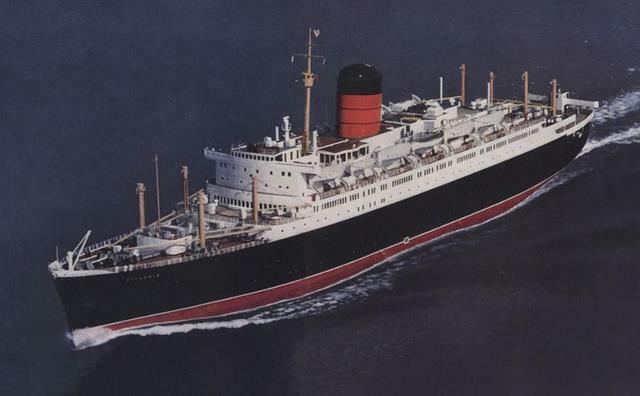 The SYLVANIA operated the Canadian service from Liverpool in company with her sister the CARINTHIA during the summer and Autumn of 1957 until the end of the St Lawrence season. 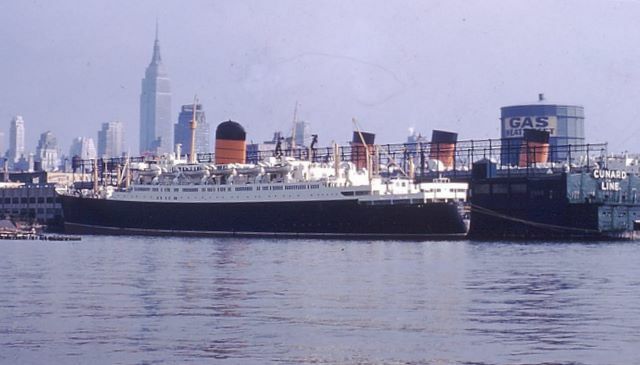 Her maiden arrival at New York was on 17th December 1957 and she then sailed on a Christmas cruise to the West Indies. On 10th January 1958 she resumed trans-Atlantic service, and on the 5th April returned to the Canadian run. 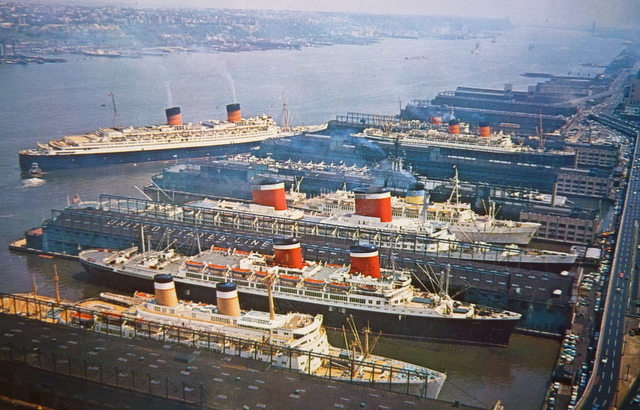 The principal passenger liner piers at New York in the early 1960s. whilst on the north side of Pier 92 the SYLVANIA's funnel can be distinguished. 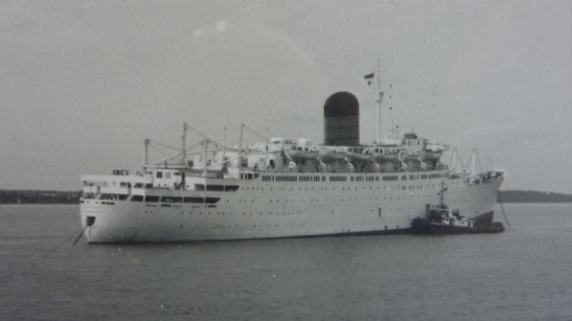 In the SYLVANIA's first full year of service (1958), some 1,036,000 passengers crossed the Atlantic by sea. However, this was also the year when the first commercial jet service was introduced between Europe and New York and there was an immediate effect, in 1959, on the number of passengers who chose to cross by sea. For the SYLVANIA and her sisters, built without any real thought toward even occasional use as cruise ships, this was bad news indeed. The SYLVANIA served on the Canadian run for only a relatively short time. 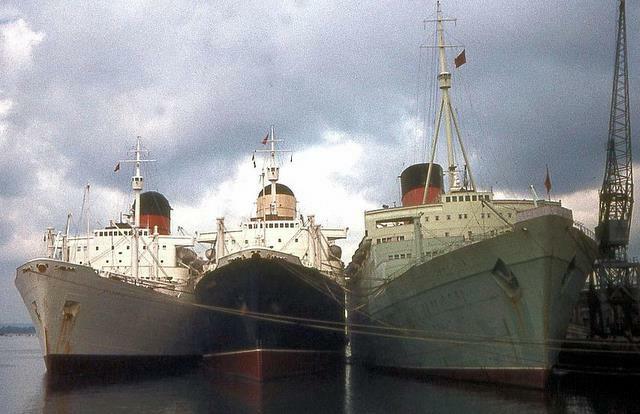 In November 1960 it was announced that she would replace the BRITANNIC on the Liverpool - New York service. Any thoughts about building a replacement for the BRITANNIC had been abandoned due to the increasingly poor results from Cunard's passenger liners, and the general manager's 'gung-ho' comments on the eve of the SYLVANIA's maiden voyage just three years earlier now sounded rather hollow. 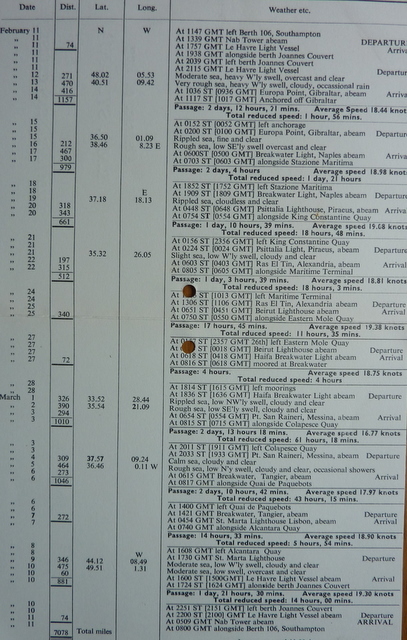 service from 1961. She is seen here arriving at Pier 92, New York. 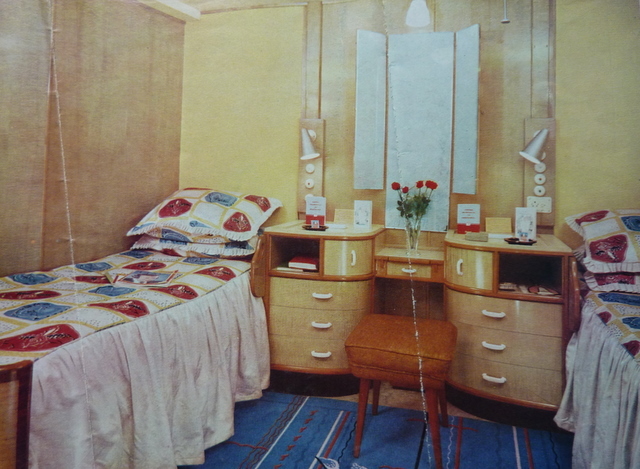 During her annual refit in January 1964, eighty of the SYLVANIA's tourist-class cabins were refitted and equipped with private bathrooms. Whilst this was a welcome move, it was far from enough to make her competitive with other liners then in service. It was a token gesture - after all there were 250 tourist-class cabins. 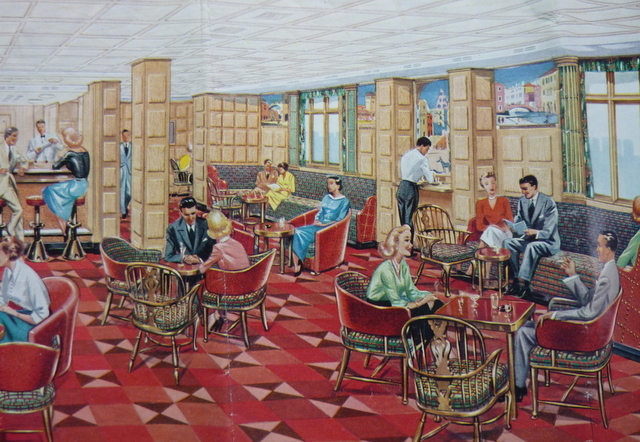 It was becoming clear to the Cunard Line directors that the demand for trans-Atlantic passages during mid-winter was in terminal and rapid decline, and on 10th February 1965 the SYLVANIA made a 27-day cruise from Southampton to the Mediterranean. 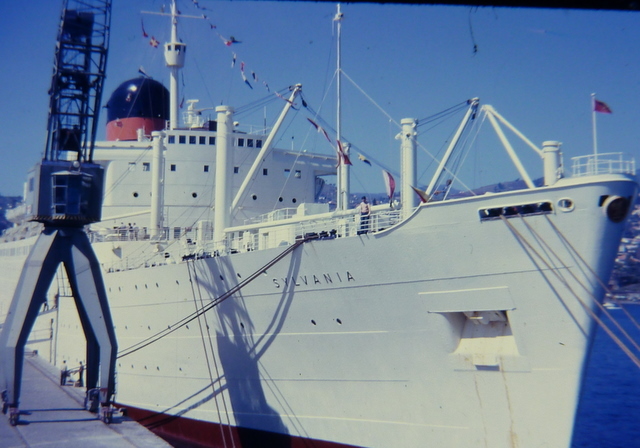 The following winter saw the SYLVANIA more extensively employed on cruising until 20th April 1966. Hardly had she settled back on the Atlantic than the six-week seamen's strike commenced in mid-May and the SYLVANIA got caught up in the dispute when she docked at Liverpool. 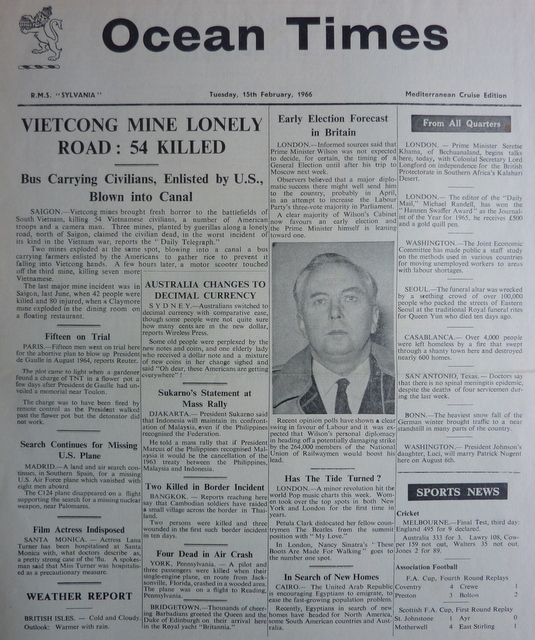 Three weeks after the end of the strike, on 22nd July 1966, Cunard's chairman Sir Basil Smallpiece informed the Company's employees, both afloat and ashore, just how serious the financial situation had become. The seamen's strike had cost Cunard £3 million. Sir Basil commented: "This is the bottom of the barrel. There is enough left in the kitty for eighteen months, perhaps a couple of years, but that's it. In the past five years the passenger liners have bled Cunard to the extent of £14 million in total losses." 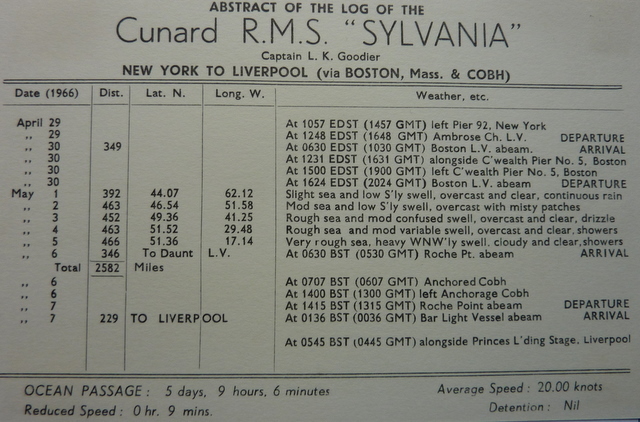 The Cunard Line closed the Liverpool - New York route at the end of 1966 and the SYLVANIA made the final crossings in November. 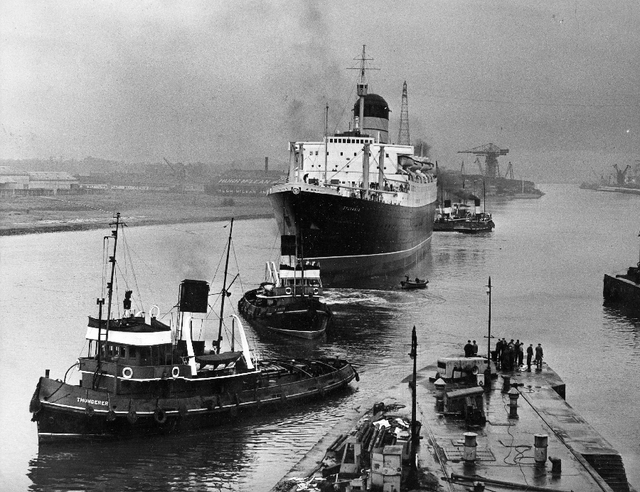 The Mersey Docks & Harbour Board shed no sentimental tears: it had always been more interested in long-stay cargo ships rather than quick turnaround passenger liners. 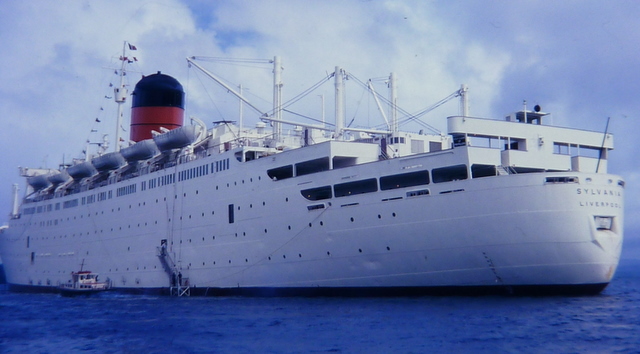 The SYLVANIA had her hull painted white during her 1966/67 overhaul, and on 13th January 1967 she sailed from Southampton on a 36-day cruise to the Caribbean. 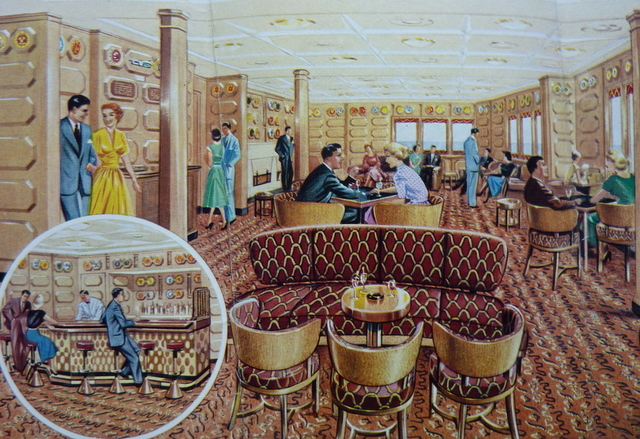 Only the public rooms had air-conditioning and the passenger cabins had to make do with forced draught and fans. It became intolerably hot at times. On her return from the West Indies, the SYLVANIA was based at Gibraltar for a series of five Mediterranean cruises. 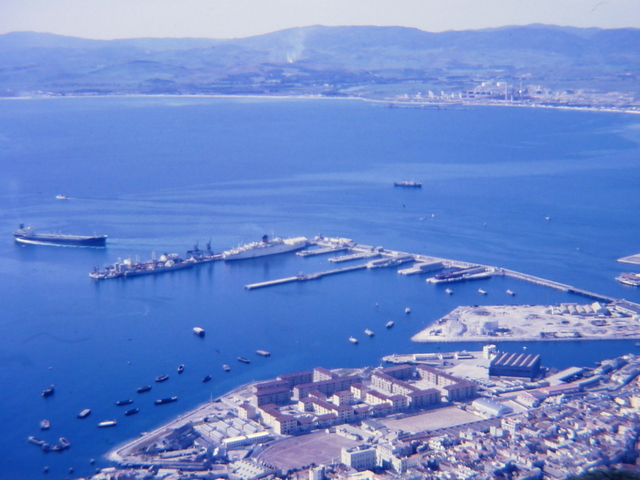 The passengers were flown from Gatwick to Gibraltar and the concept of 'fly/cruise' holidays was introduced. with the SYLVANIA alongside the breakwater. 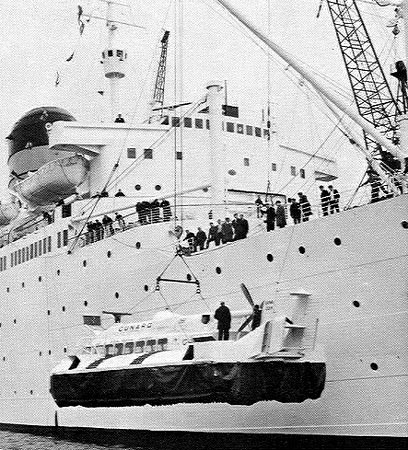 During these cruises the SYLVANIA carried a SRN-6 hovercraft on her foredeck. The British Hovercraft Corporation was trying to interest the governments of various countries bordering the Mediterranean in purchasing hovercraft, and to give government officials a practical demonstration of the hovercraft's capabilities it was put into the water, using the ship's gear, at various ports and sent on demonstration runs. The hovercraft was not there to provide sight-seeing trips for cruise passengers, although occasional short trips for passengers were made 'around the bay' between the official runs. Lowering and recovering the hovercraft was a time consuming business for the deck crew involving considerable overtime, but fortunately British Hovercraft was picking up the tab for this. The hovercraft was stowed at the after end of the SYLVANIA's foredeck. 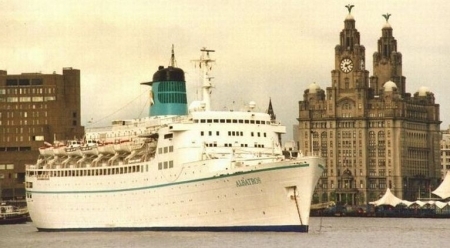 After completing her cruise programme the SYLVANIA returned to the Canadian service, alternating between Liverpool and Southampton as her terminal port in the UK. 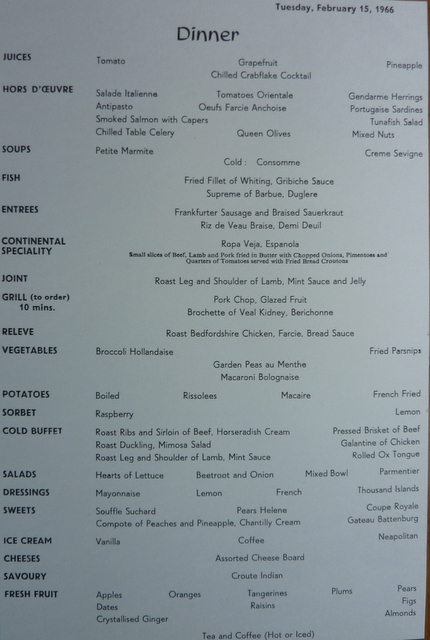 It was 'EXPO 67' (the World Fair) at Montreal, and Cunard hoped to attract passengers who wished to visit the Fair. After leaving Montreal on 15th June 1967, the SYLVANIA ran aground just below Trois Rivieres, and all efforts to refloat her failed. She had on board almost a full complement of passengers, and two days later they were taken off by tender and offered an air passage or a berth on the next Canadian Pacific sailing. The SYLVANIA stubbornly refused to be refloated and it was only when her bunkers and fresh water ballast had been pumped out, and the crew sent away in the lifeboats, that she reluctantly came off the St Lawrence mud. 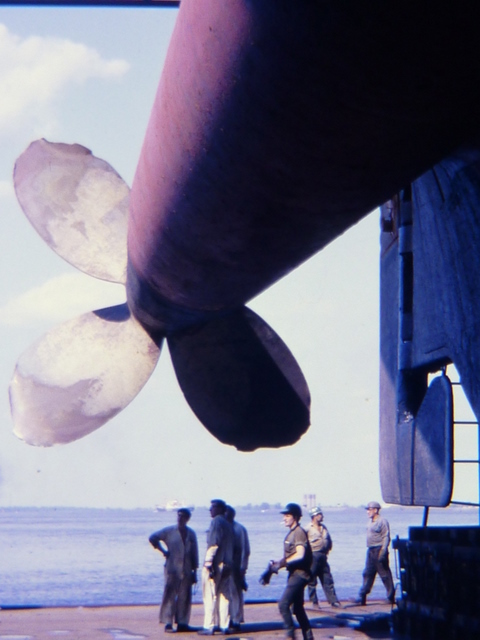 She was towed back to Montreal and entered Canadian Vickers' floating dock on 26th June, and remained there for three days whilst damage to her propellers was made good. Her entire crew was living aboard during this time, which was extremely trying for all concerned as the ship was virtually shut down with no forced draught in the heat and humidity of a Canadian summer. 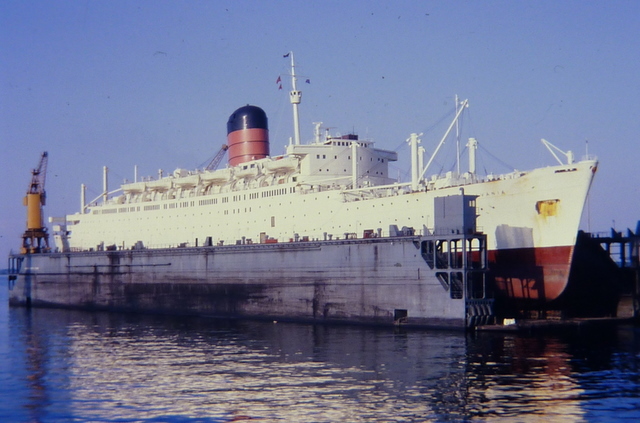 After leaving the floating dock, the SYLVANIA returned to Montreal until her next scheduled eastbound sailing on 4th July. 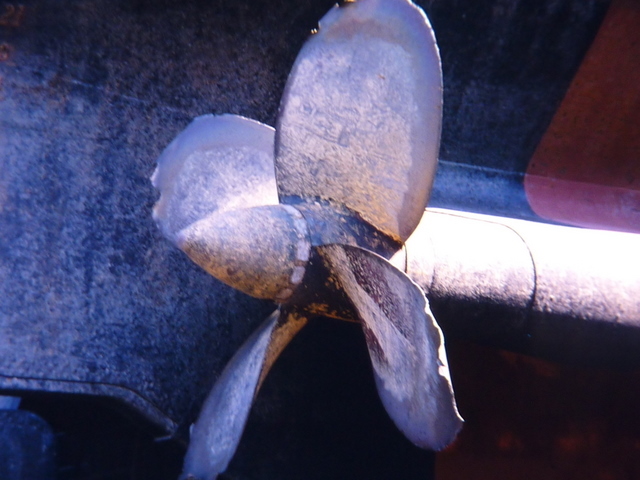 Damage to the SYLVANIA's starboard propeller after the grounding. 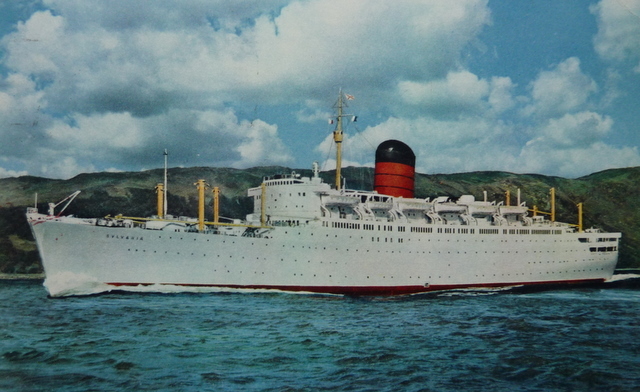 In October 1967 the Cunard chairman Sir Basil Smallpiece announced that the SYLVANIA would be withdrawn from service, along with the CARINTHIA and the CARONIA. In a masterstroke of public relations, Sir Basil said that the SYLVANIA was unsuitable for crusing, and then wondered why the passenger numbers were so low on the extensive cruising programme which lasted until 7th May 1968. 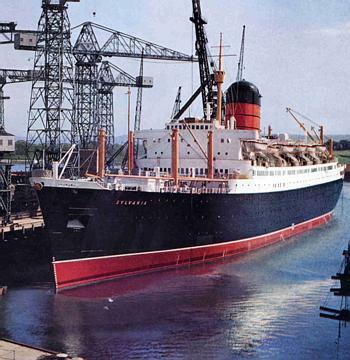 The SYLVANIA sailed from New York on 11th December 1967 for Southampton with 462 passengers, the only Cunard liner to make a North Atlantic Christmas crossing. She called at Halifax, Nova Scotia, for seventy-seven more passengers. The SYLVANIA in the Firth of Clyde with her 1967 white hull. The SYLVANIA completed her Cunard service almost eleven years to the day after she had left Greenock on her maiden voyage on 5th June 1957. 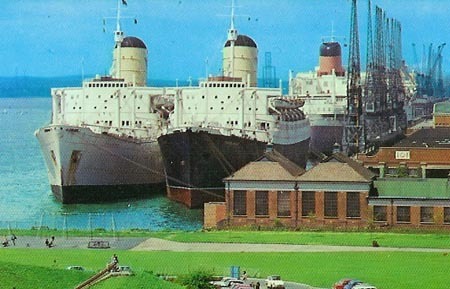 She was laid up at Berth 101, Southampton, alongside her sister the CARINTHIA. They were redundant and outmoded, yet, ironically, their most successful years were still to come. The CARINTHIA and the SYLVANIA were both quickly sold to the Societa Italiana Trasporti Marittimi SpA (the Sitmar Line) at a price of £1 million each. 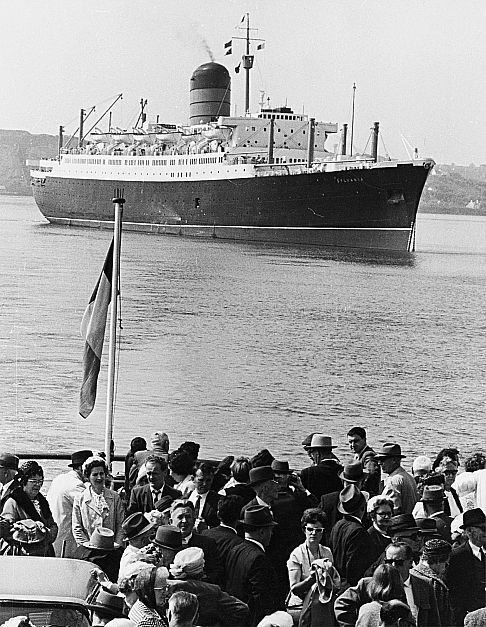 Sitmar intended operating the two ships on the Australian immigrant service, but then lost the contract with the Australian government. As a result, the two ex-Cunarders remained laid up for almost two years. The SYLVANIA's name was changed initially to FAIRLAND, and then to FAIRWIND. On 6th January, 1970 the FAIRWIND left Southampton under tow and arrived at Trieste on 18th January. 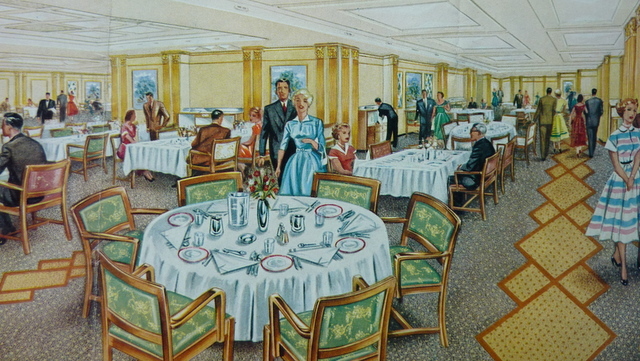 The ship was completely rebuilt and on completion was totally unrecognisable as the former SYLVANIA. Every one of her passenger cabins had been redesigned and all of them had private bathrooms. 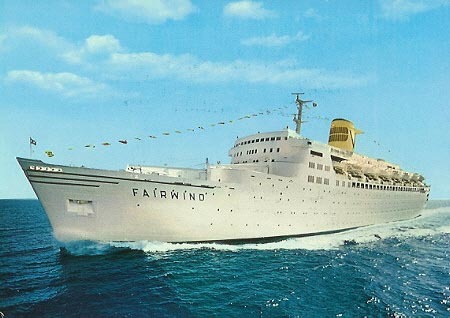 It was not until 14th June 1972 that the work was complete and the FAIRWIND sailed on a positioning voyage to Los Angeles. 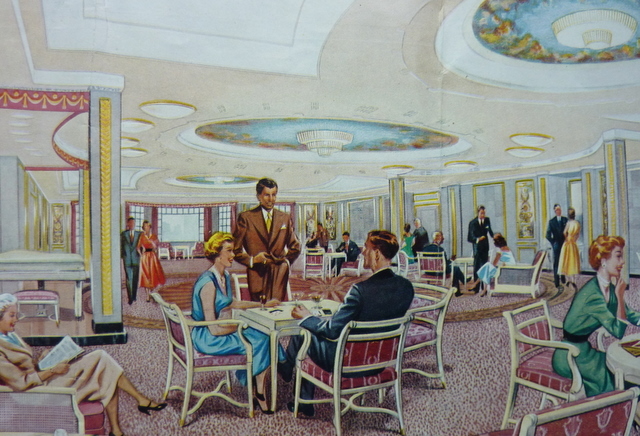 Sitmar advertised the FAIRWIND as 'the most luxurious cruise ship ever seen in most parts of the world'. The FAIRWIND's usual route involved transits of the Panama Canal on voyages from San Juan to Acapulco, and from Los Angeles to Mexico. The reputation of Sitmar Cruises continued to grow. The FAIRWIND with her sturdy North Atlantic hull and strong bows, built to withstand any seas, ensured her passengers a far more comfortable voyage than any new purpose-built cruise ship could offer. 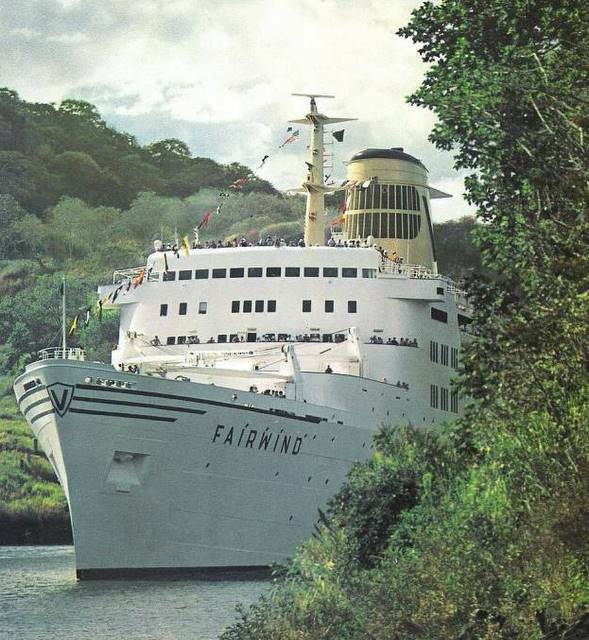 After twelve years of successful cruising the FAIRWIND was completely refurbished in 1984. 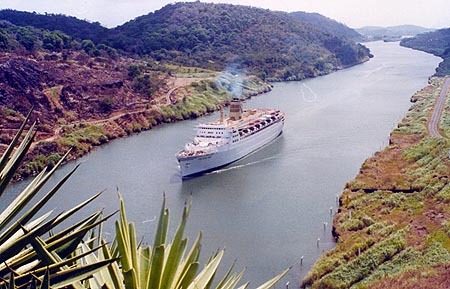 In 1988 she made two cruises up the Amazon as far as Manaus. Later in the year one of her propeller shafts fractured and she had to be towed to a San Francisco shipyard for repairs. When she reappeared it was with the extended name SITMAR FAIRWIND. As if to show disapproval for this new name, the ship broke down again a few weeks later off Nassau and had to be towed to New York for lengthy repairs. On 28th July 1988, P&O acquired the entire share capital of Sitmar Cruises. The price paid was $210 million. This meant that the FAIRWIND returned to British ownership. She was given a new name, the DAWN PRINCESS. Her first cruises for P&O took her from New York to Halifax, Quebec and Montreal. It was indeed ironic that she should return to the old familiar waters of her Cunard days. 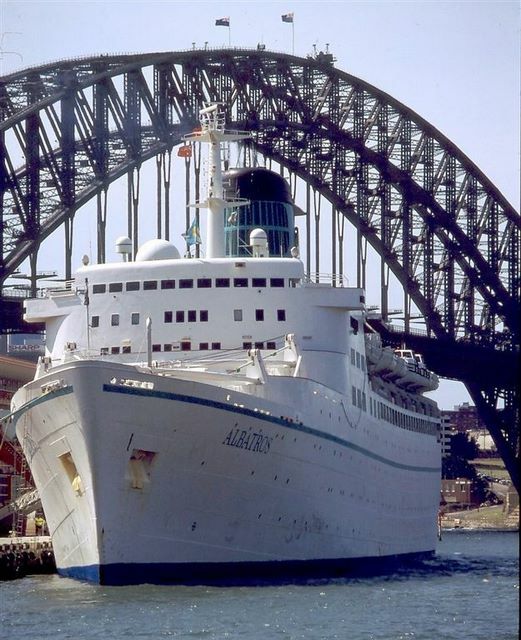 During a drydocking in Portland, Oregon, in 1991, asbestos was discovered in the DAWN PRINCESS with the result that the vessel was out of service for three months whilst it was removed. 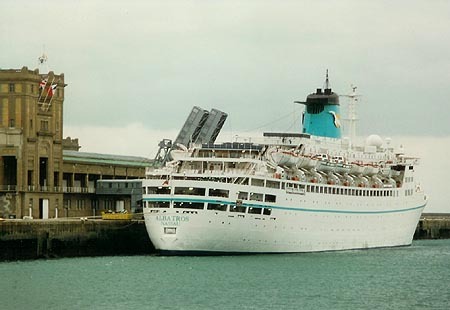 In 1992, P&O Cruises stated that the DAWN PRINCESS (ex SYLVANIA) 'no longer fits into the Company's modern fleet', and in 1993 she was withdrawn from service. 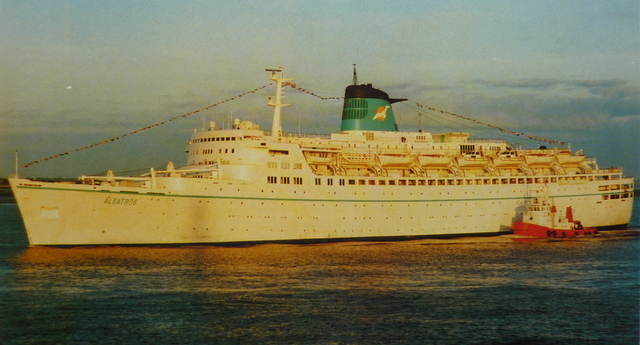 She was purchased by Happy Days Shipping and on 18th August 1993 she was renamed ALBATROS, on charter to the German tour operator Phoenix Reisen. A couple of years later the ALBATROS sailed from Bremerhaven on a two-week cruise around the British Isles. She called at Liverpool on 13th May 1997 and three days later was at anchor off St Mary's in the Scilly Isles. Shortly after sailing, the ALBATROS struck the well-charted North Bartholomew Rock in St Mary's Sound. Her 504 passengers remained on board until a chartered ferry took them to Penzance a day later. The ALBATROS sailed to Southampton under her own steam on 25th May and was dry docked. It had been the most serious incident of her long life. What saved her from becoming a total loss was the extra strength built into the ship to help withstand the ice of the St Lawrence on her designed route during her Cunard days. seen at Dunedin, and below at Napier. 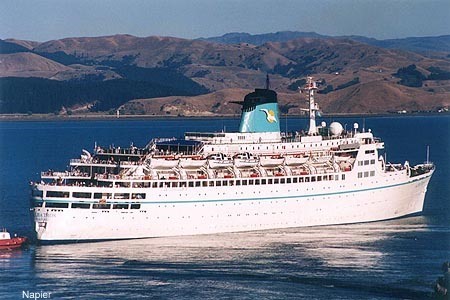 The ALBATROS returned to service with Phoenix Reisen and completed another six years of ambitious cruises, which included an amazing 130-day world cruise in 2001. 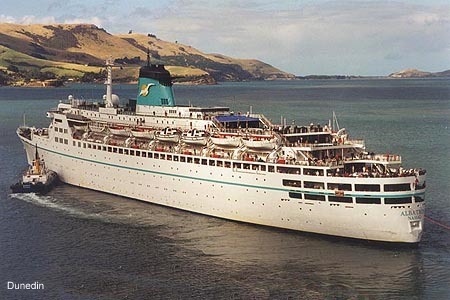 The end came in November 2003 when the 46-year-old former SYLVANIA was taken out of service allegedly due to technical problems, and a planned world cruise was cancelled. another voyage to Quebec and Montreal, via Greenock.